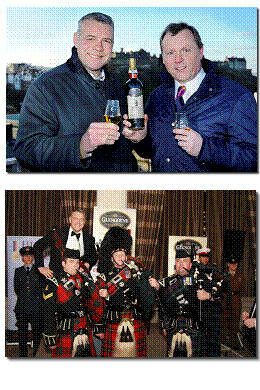 13 February 2012, Edinburgh: Scotland rugby legend Scott Hastings has teamed up with award-winning Glengoyne Highland Single Malt Whisky to launch a new limited edition ‘Auld Enemy Dram’ in aid of charity. Glengoyne hosted a new sporting dinner: The Glengoyne Auld Enemy Dinner at The Balmoral Hotel in Edinburgh on Friday 3rd February 2012, bringing together rugby legends and supporters to celebrate the history of the Calcutta Cup. Held on the eve of the world’s oldest international rugby fixture, the new event will become an annual occurrence taking place in Edinburgh and London respectively. As well as providing warming drams throughout the evening, Glengoyne recognised the past exploits of players of this iconic game and honoured the occasion by releasing a limited edition ‘Auld Enemy Dram’, a Glengoyne 1990 Single Cask bottling. Proceeds from which will go to their two chosen charities - Help For Heroes and The Bill McLaren Foundation. Scott Hastings led proceedings at The Glengoyne Auld Enemy Dinner, also attended by Scotland and England ex-internationals from the past 40 years, including, Finlay Calder, Gavin Hastings, Peter Winterbottom and Matt Dawson, along with many other Calcutta Cup veterans. Neil Boyd, Commercial Director at Ian Macleod Distillers, commented: ‘‘Glengoyne Highland Single Malt Whisky is proud to have been the official sponsor of the inaugural 2012 Auld Enemy Dinner, which was a fantastic success. Established itself in 1833, Glengoyne recognises and celebrates the passion that is synonymous with this great rivalry, and the commitment and dedication of those that compete annually for the famous Calcutta Cup. Glengoyne is one of Scotland’s most accessible distilleries, located just 30 minutes north of Glasgow in a beautiful wooded glen overlooking the breath-taking West Highland Way.